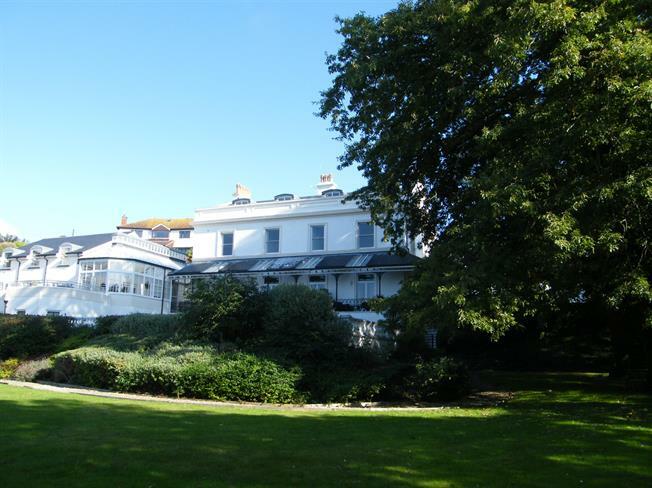 2 Bedroom Flat For Sale in Torquay for Offers in excess of £150,000. For sale with no onward chain, is this two bedroom lower ground floor apartment set within a stylish gated development. The property features two double bedrooms, each with a feature arched recess area offering a generous amount of storage, an open plan living room with a feature arched dining area recess and fitted kitchen with appliances. A family four piece bathroom is situated next to the master bedroom. The communal areas are a credit to the management company and boast a landscaped garden area and patio. The property benefits from secure gated parking, a lift and stairs to all floors within. (Measurements do not include the feature arched area) two wall mounted radiators. Television aerial point. Arched recess area includes a storage cupboard and dual opening patio doors leading to the communal gardens and patio. (Measurements not including feature arched recess leading to the communal gardens) fitted with a range of modern matching base and eye level units with roll top work surfaces over. Integrated appliances include a fridge, freezer, washer dryer, oven, four ring hob, filter canopy and dishwasher. One and a half bowl sink and drainer with mixer tap over. Extraction fan. Inset ceiling lighting. Recess area includes a storage cupboard and dual opening patio doors leading to the communal garden and patio areas. (Measurements not including the feature arched area) wall mounted radiator. Inset ceiling spotlighting. Recess with patio doors leading to the communal garden and patio with storage cupboard. (Measurements not including the feature arched recess area) wall mounted radiator. Inset ceiling spotlighting. Recess area includes a large walk in cupboard which houses the combination boiler. Dual opening patio doors leading to the communal gardens. Four piece suite comprising of a bath with twin hand grips, corner shower cubicle with mains fed shower, wash hand basin and low level flush WC. Tiled walls. Wall mounted ladder style towel radiator. Extraction. The property features use of the landscaped communal garden and patio. A bin store is located to the conclusion of the gardens. This property features a secure gated parking area with a designated space for this apartment. There are two further visitors spaces but these can only be used if the resident allows entry through the gates.